Back when I took up quilting, I was using invisible nylon thread in the top and cotton thread in my bobbin. Invisible thread solved the issue of what colour to use for quilting on the top side, and hid any little side tracks my needle took that weren’t in the plan. The same reasons people use it still. Now, at the time, polyester invisible thread either wasn’t available or I didn’t know about it. But the nylon version I used was NOT fishing line, but a reputable brand purchased from the quilt store. 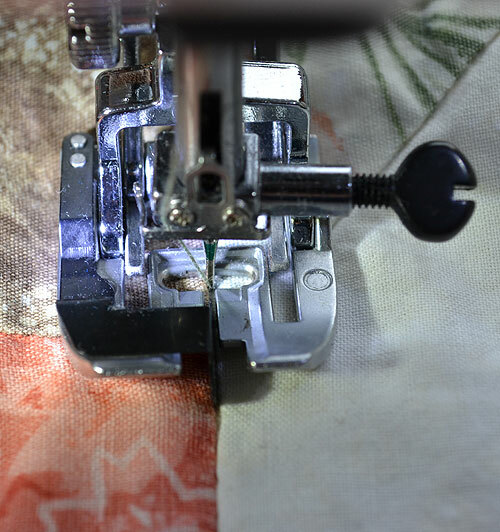 After quilting a couple or so quilts with the stuff, I noticed that when I was back piecing with my cotton thread I was getting a lot of breakage. Upon inspection, my needle clamp on my Bernina 1630 had a groove worn right in it. The cotton thread was now passing along this groove and being shredded. I took the machine to my local serviceman, and he buffed the groove out. 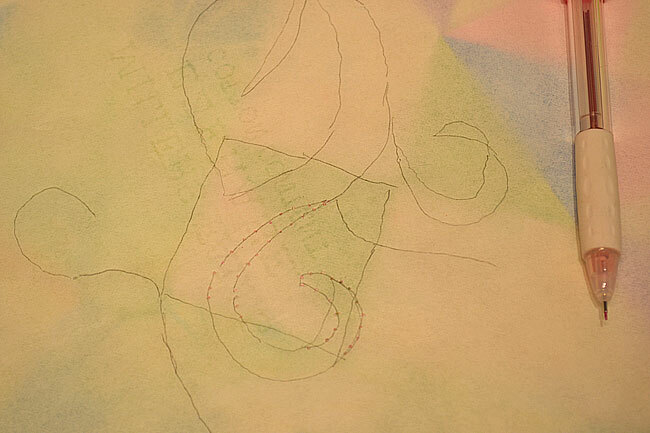 Right then and there, I decided I wasn’t going to use invisible thread again – a promise I’ve mostly kept. Well, actually, yes, I knew that, and followed that religiously. My local quilt shop had taught me all the protocol for using this thread – loosen the top tension considerably, make sure it can unwind and get tamed well before it makes it to the tension disks, etc. 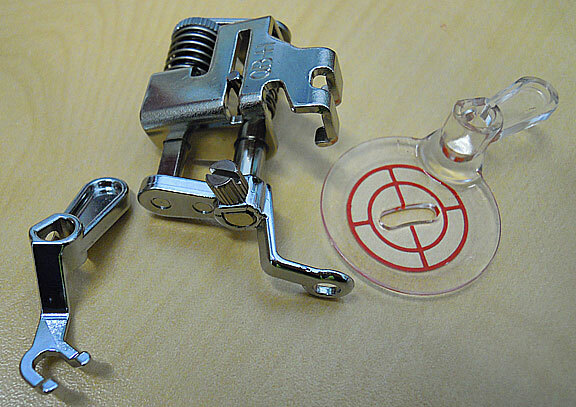 But the thread guide on that Bernina directed the thread so it came straight down and close to the needle clamp. No loosey-goosey threads before it went in the needle. A design feature that I think was rather smart. So a few years passed, and one of the quilts I used the nylon invisible thread on was well-loved and well washed. And I know I put it in the dryer on occasion. 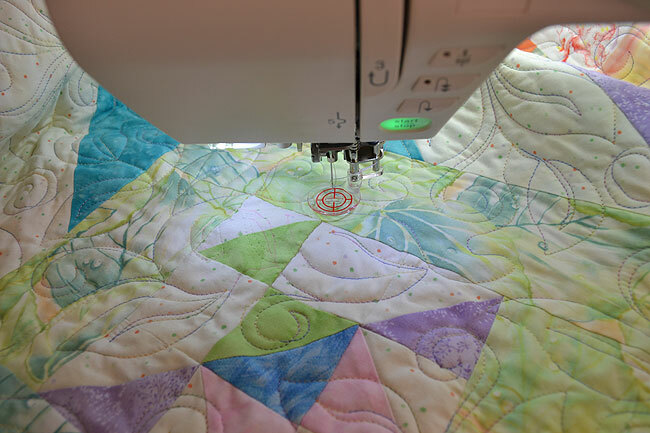 Whether it was the dryer that made the invisible thread brittle and break, or if it was the weight of the quilt, my quilting stitches were coming out. This is not a problem I’ve encountered when quilting with cotton thread only. Now that’s my disclaimer. I don’t want anyone to think I’m starting a hate campaign, or trying to draw lines in the sand. That’s not really my point. My point is that after Tuesday’s success with my New Beginnings Issue, I decided to fix this old quilt’s problem. An oldie-goldie problem, as it had been sitting in a drawer for years waiting to be tackled. I decided that the quilt was not in good enough shape to warrant spending countless hours unpicking the remaining quilting stitches. So I dug out a spool of variegated 30 weight Sulky Blendables cotton thread that matched both the back and front of the quilt, and set up my Elna Excellence 740 for some stitching time. This was a great opportunity for me to try the integrated adjustable feed (acufeed) ditch quilting foot. Pat A. had used hers just a few days ago, and told me she quite enjoyed stitching with it, so this was my opportunity to put mine through the test. Boy did that Ditch Quilting foot work well! The guide helps you stay in the ditch. As with all the integrated feet, it fed through quietly and easily. There is no clunk-clunk feel that is to be expected with a regular walking foot. I was rather worried that since the quilt had been through a few washes and was slightly wrinkled, that I might end up with puckers on the back. But no! The auto-lock feature was also great to use. I wanted to make sure that this bunch of stitching wouldn’t come out, so I took a couple of stitches forward, then backward, hit the auto-lock button which sewed in place a few times, and then stitched my row. At the end of the row, I took a couple of backward stitches and again used the auto-lock button. I then pushed the thread cutter button, and I was ready for the next row. Most of the quilting was done in the ditch, but I also had some free-motion on the border. 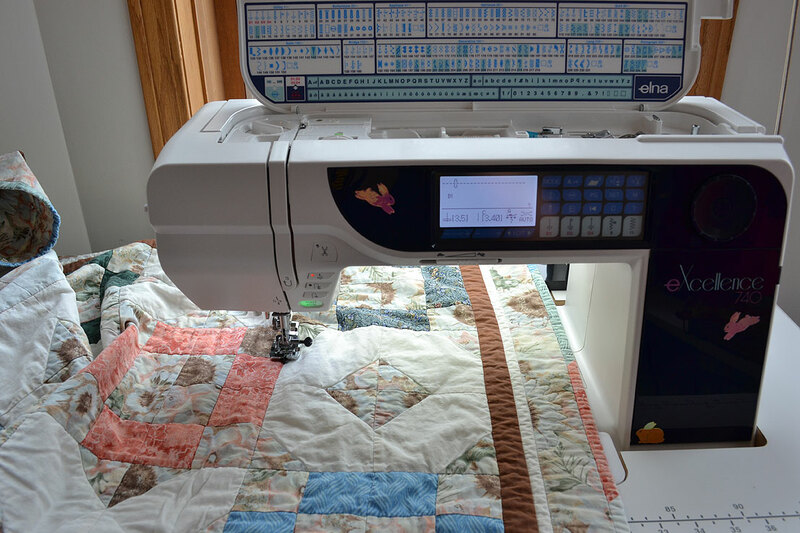 For this I used the convertible free-motion quilting foot with the open toe. I quite like this foot as well. 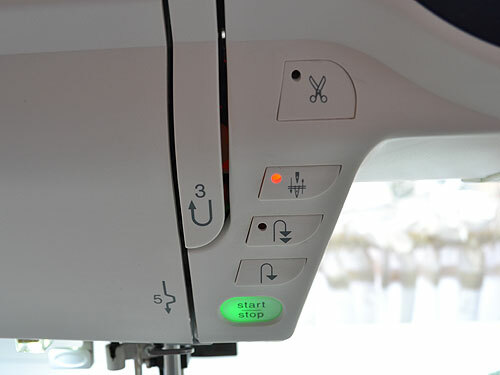 The height is adjustable, and it is not a hopping foot (where there is an appendage that sits on the needle clamp and goes up and down with the needle motion). In five hours, I had that quilt completely re-quilted. What a feeling! There is nothing like getting old problems and tasks finished! And now someone can squirrel it away to their bedroom again. Everyone has one. The quilt with an Issue. 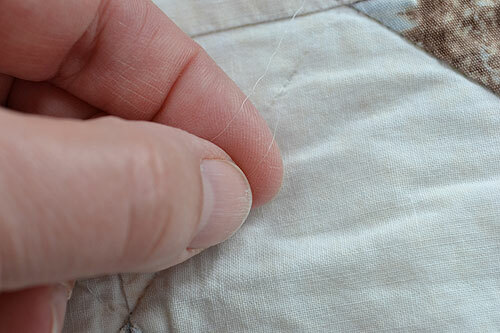 I didn’t know that this particular quilt actually had an Issue though, until I got it back from Jane, my long-armer. Matter of fact, I believe it was after it was bound ready to be hung in the store that someone pointed out the Issue. That was when my stomach sunk. Now this quilt had to be hung without delay. I designed it for our Block Bonanza program, and it was now finished – just in time – for its unveiling. Selling finishing kits meant that people needed to see the final product. So up it went in the store, and only a select few knew the Issue. And, thankfully, no customers spotted the problem, or else they were wonderfully polite and ignored it. God bless them. That was a more than a year ago, and the quilt had come down a few months later. But since it is March and the quilt is done in beautiful spring colours, the time had come to gather up my nerve, and fix it so it can once again be hung in the store, and featured on-line with a real photo, instead of the EQ drawing. So today was the day. The Issue: There are four blocks all identical in the quilt. However I had turned a half-square triangle upside down in one of them. Now, if this wasn’t “the quilt” for my pattern, it wouldn’t have mattered as much. But you can’t go and design a pattern, and then not sew it up accurately. Anyway, I like my stuff done right, and this was a real needle in my thumb. 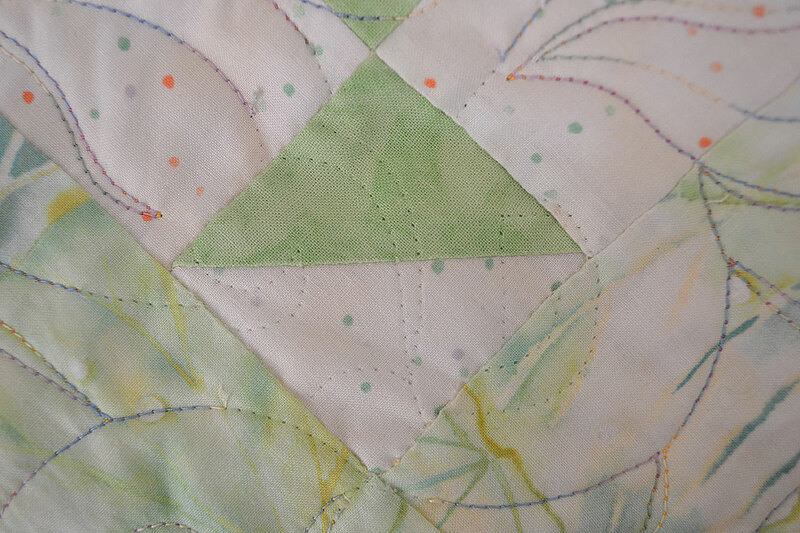 I started with laying a thin sheet of onion skin paper over the quilting design that was stitched on top of the nuisance half-square triangle. I traced in pencil the design. Then I unpicked the quilting stitches. I then took a moment to reflect that any step past this point might mean ruining the quilt if I did it poorly. Gathering my nerve, I went underneath a stitch of the square with my Clover thread pic. There was no way I could get my seam ripper in there without cutting the fabric. I pushed the pic until the thread broke. Since I sew with a short stitch length, it was generally easier to take out the stitches with the thread pic than with the seam ripper. Here’s a picture of the half-square triangle after most of the stitching has been removed. I pressed the seams on the half-square triangle flat, and repressed those that needed to be folded under. 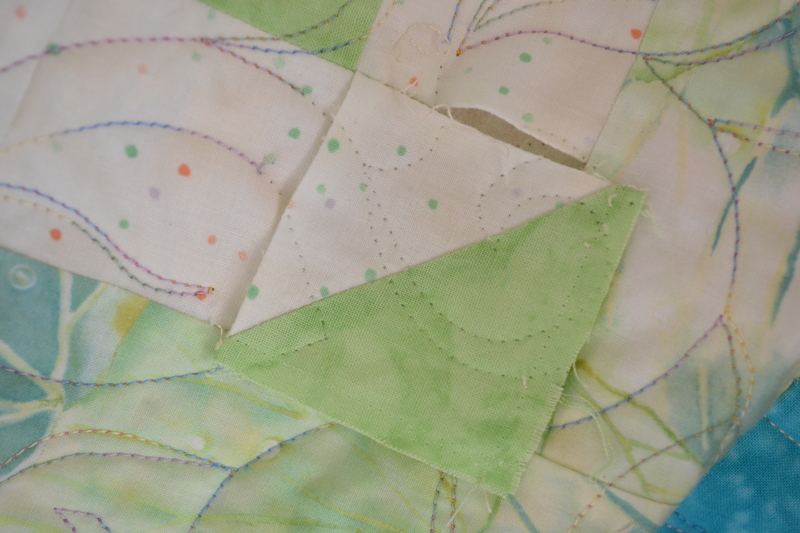 I then placed the square back in the quilt – pointing the right way! I used a single strand of matching cotton thread, and with a ladder stitch invisibly sewed the square back in place. I did two rounds, to make sure it was sewn in well. How relieved I was that the square was flat! All that embroidery I did as a kid paid off! Next I laid the paper with the quilting design back on top of the square. I chose a pink Clover mechanical pencil as the quilting thread had some purples and pinks in it. I poked through the design to the quilt top every 1/8″ or so. Then I removed the paper and connected the dots with the same pencil. I threaded the machine with the identical King Tut threads used by Jane in the top and bobbin, dropped my feed dogs, and quilted the design. 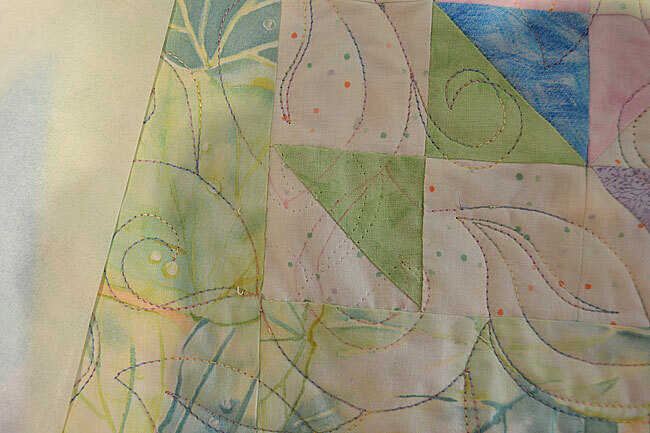 Once I finished quilting, I buried my threads. Then I used the little brush on my pencil and brushed out any of the pink markings. 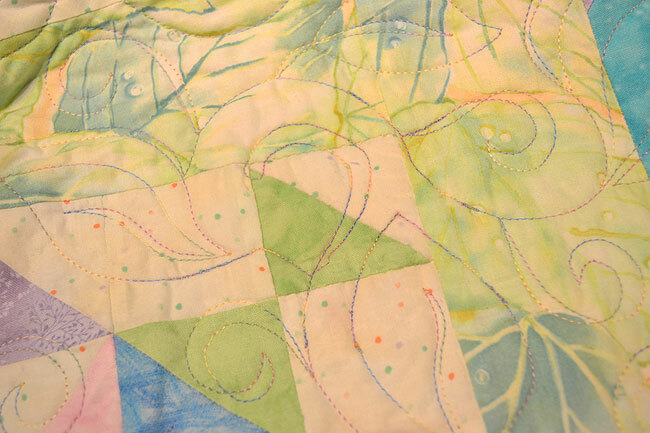 I lightly misted the spot with water, and then again lightly brushed at the previous quilting marks. Just like that they disappeared, and so did my Issue. Now with a new Spring in the air, and a rediscovery of hand stitching, this quilt lives up to its namesake, “New Beginnings”.